There are books that entertain and books that speak to our souls. This book hooked itself in my soul and left me speechless. 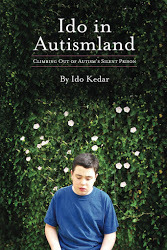 There are no words to describe Ido’s (pronounced Eh-do) journey to communicate despite the barrier of autism. Amazing. Extraordinary. Miraculous. This insightful authentic book of essays about Ido’s world is impressive—witnessing his growth from negativity to hope and possibility made me cheer for him! His language development and quick wit and humor make for an engaging read. My friend for the past seventeen years Mark has autism and is now twenty-nine. I wish more than anything to give him the tools that would allow him to communicate with his loved ones. Glimpsing his world through Ido’s words has been an uplifting and inspiring call to action to help Mark connect. Thank you Ido, for your courage, perseverance, and your beautiful heart. 24 Feb	This entry was written by Laura and published on February 24, 2013 at 11:42 am. It’s filed under Books, Connections, Friendship, Laura, Lifeology, Relationships. Bookmark the permalink. Follow any comments here with the RSS feed for this post. This sounds like something else I’d like…will check it out. too.